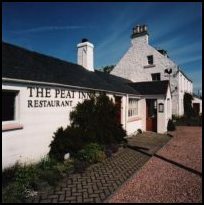 The Peat Inn is undoubtedly one of the most famous restaurants in Scotland. Internationally renowned chef David Wilson ran the Inn from 1972 to 2006, when he passed over the reigns to Geoffrey Smeddle. The restaurant has a refined yet relaxed atmosphere and the cuisine is superb. Celebrated wine cellar. Situated in an old coaching inn. 6 miles from St Andrews. Gently flowing with the seasons, this country inn's menu reflects the best of local Scottish produce at any given time. The restaurant, a stylish blend of cottagey and contemporary, would not be out of place in a French village, and the Francophile owners have developed the Gallic theme right down to the robust menu. There are some quirks, such as ordering the dessert with the other courses, but given the standard of cooking they are easily forgiven. From a tasting menu, a fixed price menu and a short carte select the likes of pan-fried venison liver served with kidneys, poached quails' eggs and a bitter orange sauce, and a traditional cassoulet filled with duck, pork, sausage and beans, or perhaps fillet of halibut with prawn risotto and yellow pepper sauce. The wine list is a real treat with its enthusiastic notes and unpretentious choices, and a friendly team pulls it all together.